The six Hypothetical puppets were made by Mari Jones and Emma Forrest here at Picture to Puppet. We made six comedian puppets which will appear tonight (February the 13th 2019) at 10pm on Dave. Our Josh Widdicombe and James Acaster puppets will be joined by our Josh Widdicombe Puppet, our Romesh puppet, our Rachel Parris puppet, our Jon Richardson puppet and our Rose Matafeo puppet! Watch our puppets on Dave! We had a great time making the Hypothetical puppets because the comedians were so charismatic and interesting to caricature. We’re proud of our Romesh puppet’s distinctive expression, of our Rose Matafeo puppet’s big smile and of our Jon Richardson puppet’s open face. You can see lots of examples of other likeness puppets we have made here! Here is our Romesh Ranganathan puppet! As with all our custom puppets, we worked hard to get the right head shape, and his squint. We even gelled his hair into shape and trimmed his beard to the right length! Here is our Josh Widdicombe puppet! In our Josh Widdicombe puppet, we tried to match his tousled curls, blue eyes and glasses. 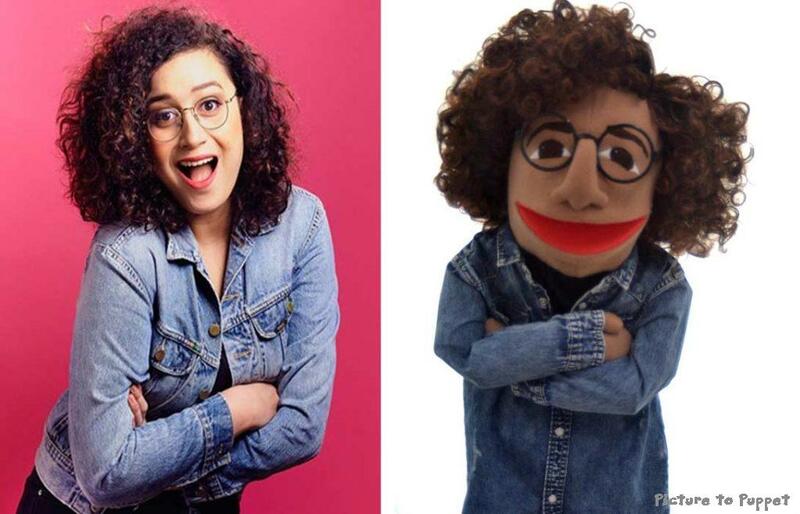 Rose Matafeo’s joyful expression was a pleasure to capture in our Rose Matafeo puppet. We also searched high and low for a tiny costume to match hers, and the right wig! We focused on Rachel Parris’s Luscious lips when making our Rachel Parris puppet. Happy to hear her say it was the hair of her dreams! When we make caricature puppets, the challenge is is often to accentuate the person’s most distinctive features whilst retaining a close likeness. Here is our James Acaster puppet! Sadly he’d had a haircut by the time the show came around, which reduced the likeness a bit. But it’s mostly in the eyebrows! I got quite attached to our Jon Richardson Puppet, because he has such a friendly face! Order your own custom caricature puppet from Picture to Puppet! You don’t need to be a TV production company to order a fabulous lookalike puppet. We make lots of custom puppets, and can make likeness puppets based on anyone you like, just send us a photo to mari@picturetopuppet.co.uk. Our likeness puppets start from £105 for a glove puppet and £250 for a hand puppet. Why not jazz up your best man speech, or surprise a loved one? For more about Picture to Puppet’s custom puppets, visit www.picturetopuppet.co.uk/custom-puppets or you could also come and visit us in our Edinburgh studio at 64 Constitution Street, where we also run Leith Toy Hospital!